At Mile House we love Rabbits. We have an annual Rabbit awareness week involving promotions on products and free advice from our nurses. 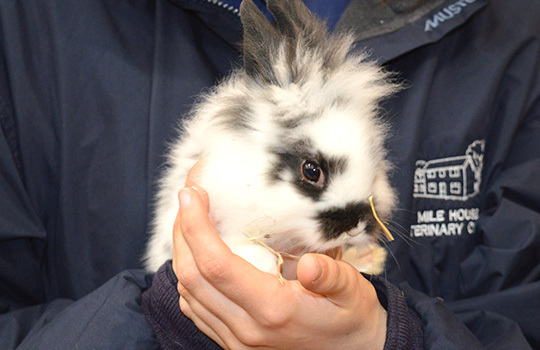 Rabbits are increasingly becoming a popular pet in the UK. Ideally they should be kept in pairs (a boy and girl is best). Rabbits can mate as early as 4 months old so be careful and always neuter your rabbits! We recommend neutering of both female and male rabbits between the ages of 5-6months of age, we also Microchip them too so they never get lost!Female rabbits are prone to developing a cancer of their uterus therefore, having them spayed when they are young prevents problems developing later in life. Male rabbits are very territorial and castration can make them easier to handle and a better friend for other rabbits to be housed with. Guinea Pigs have continuously growing teeth and also require a diet high in good quality timothy or grass hay and a small amount of pellet diet and vegetables. Avoid too many treats, starchy vegetables such as carrot/parsnip or sugary fruits such as grapes, banana as these may alter the gastrointestinal flora. They are very fussy and don’t like change so any diet change needs to be done gradually. Guinea pigs require a high level of vitamin C in their diet which should be supplemented in the form of fresh greens such as kale; cabbage;dandelions;parsley. It can also be added to the drinking water in a liquid form but the water should be changed daily as vitamin C degrades quickly. Signs of a deficiency include lameness; swelling of joints; teeth problems; depression and poor wound healing. Guineas are very sociable and should be kept in pairs or small groups. We do recommend castration of male guinea pigs to avoid problems with aggression and pregnancy. Ferrets are very playful creatures and great escape artists. They live up to 6-8 years. They are carnivores and can be fed specially formulated diets for ferrets or some high quality cat foods. They love to sleep up to 18 hours a day and have poor eyesight but a good sense of smell and hearing. It is important to vaccinate your ferret annually against Canine Distemper. Ferrets are also susceptible to the human influenza virus. They are also just as sensitive to flea infestations as cats and dogs therefore a routine flea treatment is recommended. The ferret breeding season runs from March until September. If a jill isn’t mated she will not ovulate which leads to high levels of oestrogen in her system. This results in a severe anaemia, hair loss, lethargy and weakness and can be life threatening. It is therefore important to neuter females, or provide a vasectomised male for her to mate with, therefore allowing ovulation without the risk of pregnancy. Males can also be castrated.